Book Now, Buy Now! Holiday Specials! Gifts with purchase–while supplies last–In Store Only. With the holiday season upon us, Modern Male would like to thank you for your patronage throughout the year. In order to accommodate your booking needs, we recommend that you schedule ahead during this busy time. After all, Christmas is right around the corner! Modern Male will be closed December 24th-25th for the Christmas holiday. We have added hours on Sunday, December 23rd. You can book ONLINE. Regardless if you are looking for gift ideas or just want to have a little “you” time, Modern Male is a one-stop shop. Stop in and take a break from the holiday chaos by scheduling an add-on facial or massage with your haircut. The extra half hour of time will be money well spent as you enter into a state of relaxation for only $30! Upon check-out, cross off the men on your gift list by browsing our extensive line of products. 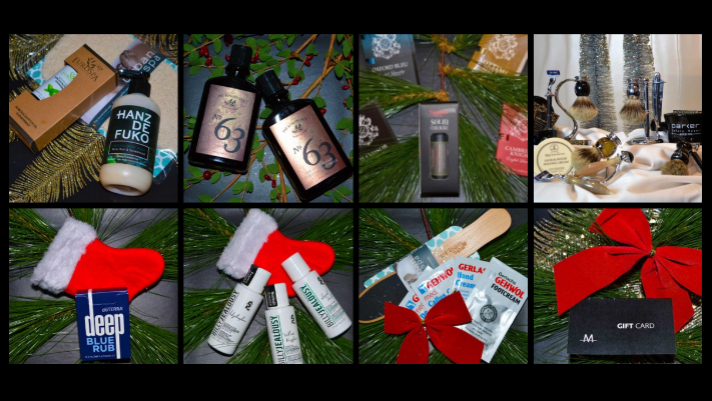 From stocking stuffers to cologne sets, and our signature shave kits (complete with a stand, safety razor, badger brush, shave cream, and blades) – Modern Male has gift ideas that will please any budget! Not entirely sure what to get? No problem! Buy a gift card and get an extra gift included with purchase. Please visit www.modernmalespas.com for a full list of details.